It was a late night last night - drinking beer in our friend’s pub and enjoying a French restaurant – but we’re up and out, slightly bruised of eye and bleary tailed, to meet our 6am cab to Stansted. Security for once is fairly hassle-free, though Stevie is subject to a random check! We see the Alps, and what we’re sure must be the Matterhorn, from the plane, which is really impressive. Some of the mountains have secret lakes at the top, hidden in a dip between peaks. It’s cool to think that people might only have known about these since air travel began, and yet they’ve been there for hundreds of years. We pick up our cab to Orto from Malpensa without a hitch and we’re soon being whisked through the Italian suburbs. I am surprised at how built-up everything is: I’d been expecting some countryside between the city and the lakes, but it’s all fairly urban. On the approach to Orta however, everything changes as we start to climb and then descend. The sunlight glimmering off the lake and reflecting off the creamy architecture and terracotta roofs is beautiful. We reach a tight bend where the buildings on either side crowd in on each other, almost creating a corridor, and the cab stops. We assume this is as far as we go, and start to undo our seatbelts (the cabbie doesn’t really speak English, and we don’t really speak Italian), but he just folds in his wing mirrors and starts off again. After a couple of hundred yards, the buildings open out again into a wide piazza, the cab swings around and: we’ve arrived at Orta San Giulio, on the banks of Lake Orta. Stevie has been here before but I never have, and it’s lovely. Our hotel is lovely, the room is huge, and we have a small balcony. We drop our bags, get acquainted with the quirky room (a massive shower in the corner of the main room; toilet in a separate ‘bathroom’), and set out to explore this little town. Orta San Giulio is quite busy for late season – it must heave in July/August – but how much busier must that make the likes of Garda or Maggiore? I’m glad we’ve come to Orta, it’s a little gem. Keeping the lake to our left, we continue down the street on the opposite side of the piazza to the one on which we arrived, and end up at the gates of a very grand villa indeed. Once the road (lane) has petered out of gift shops and restaurants, there’s a very smart hotel and then the grand villa… and that’s it; just under a mile from the piazza to the end of the road. And there are tiny lizards everywhere, darting in and out of all the smallest nooks in the walls. We spend the rest of the afternoon and evening relaxing in the bar next to the hotel – Café Venus – which also just happens to look out onto the lake, and Isola San Giulio which is just offshore. Heaven! Stevie greets the café owner by name – he looks slightly bemused (it was four years ago) – and asks why he cut his hair. Enlightenment begins to dawn… and after San Pellegrino, Moretti, salad, pizza, Valpolicella, ice-cream and limoncello, they’re best of friends once again. (NB: just saying ‘pizza’ and ‘ice-cream’ like that really doesn’t do this place justice. The menus for each are like bibles). The in-room drencher shower is wonderful! The shower head is one long pipe, it’s like showering under a waterfall. I’d love to stay in longer, but apparently I spend long enough in the bathroom already. We take a boat over to Isola San Giulio (employment prospects in Orta San Giulio appear to consist of: accommodation, bar, café, souvenir shop, or boat trips. I can only guess what they get up to during the winter months), which is like a tiny Mont St Michel. It takes us all of 15 minutes to walk slowly around the periphery, including a stop on one of the many jetties for a photo opportunity back to the mainland. By the time we sit down on the terrace of the (only?) restaurant on the island, the other tables begin to fill – we really got here at the right time. Our salads are glorious, plump juicy tomatoes and dripping with olive oil; it’s too hot yet for more alcohol, so we leisurely toast our aqua frizzante to the view and return to the mainland. 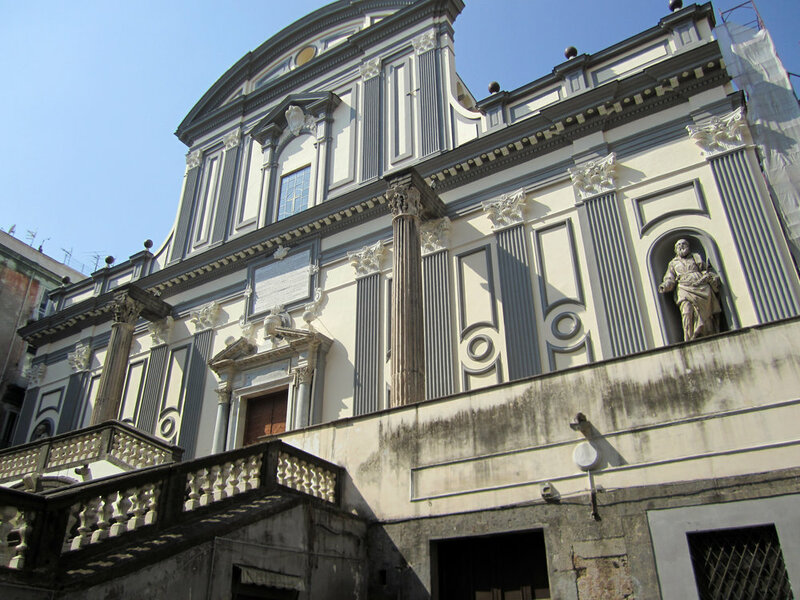 With some trepidation on my part – it really is warming up – we tackle the climb to Sacra Monte, at the top of the – small mountain? Big hill? – that marks the boundary of the centre of Orta San Giulio and the rest of the world. At the top are 17 chapels telling the life of St Francis in statues and frescoes. Some of these are incredibly ornate pieces of art. Predictably enough, the evening is spent at Café Venus once again… more ice-cream and beer? It would be rude not to. 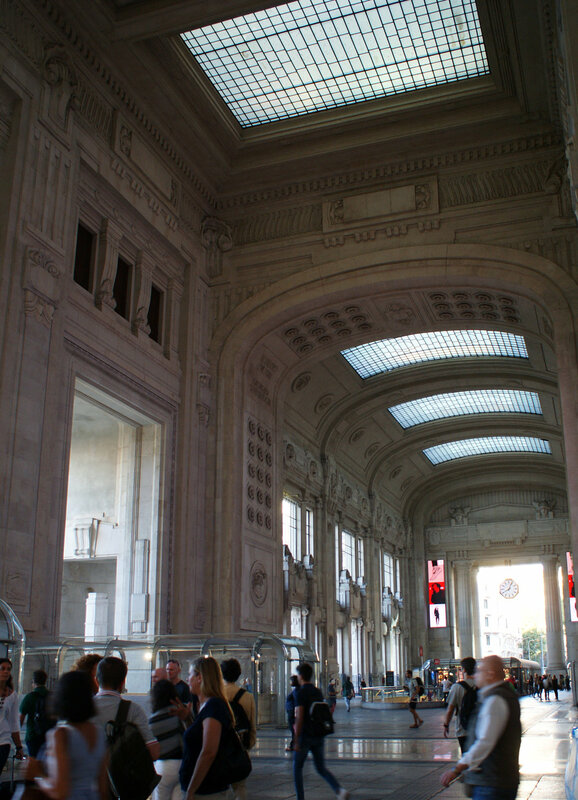 Today, we move on to Milan, which involves a long taxi ride into the centre. Next time, we’ll take a taxi back to the airport and the shuttle from there… live and learn. We even had to change cabs in the middle of town, and the reason why isn’t immediately obvious, though it does gradually become apparent that the only cabs in town appear to be white (in the same way as they are black in London and yellow in New York) – so assume that these are the only ones allowed to operate in the city centre. We meet the lovely Stephania at our hotel (with whom I’ve been exchanging charming emails concerning our arrival time), which is situated in a typical Italian apartment block very close to the Duomo, and is very welcoming and comfortable. After a quick freshen up, we head out to check out the impressive Duomo. Its spiky roof is vaguely reminiscent, to me, of the four towers atop the Sagrada Familia, and the whole building is very imposing. Set in a huge Piazza, it screams ‘stand in the middle of this expanse of nothing and admire my majesty’ – as it was no doubt intended to. We take a turn around the equally impressive monument to more recent focus of worship, housed in the adjacent designer shopping mall, and then out the opposite end and into Milan proper. After a short exploration of Milan, it is now late afternoon, so we find a charming café on Via Dante and enjoy a scrumptious club sandwich, washed down with Moretti and limoncella. We can’t resist another pit-stop on the way back to the hotel, which has the double delight of serving Leffe and an uninterrupted view of the Duomo, as the sun goes down. Breakfast is served to our room in a box (there is no restaurant facility) which is a first, but charming. We check out as we leave the hotel for the day, as we have an early start in the morning (our train for Rome leaves at 9am), and head off to the castle. The castle towers are massive round structures, on 10 levels, and have been rebuilt several times, circular towers not being the strongest when attacked. The castle courtyard is huge, plenty big enough to practise a full-on joust; my little point and shoot takes 10+ shots in order to compile a panoramic. ‘Aww,’ I say to Steve, ‘look, a castle cat!’ and promptly take its photo as it lays panting in a small patch of shade. And then spot two more under a bench. ‘How cute!’ And then, glancing over into a grassed-in moat – ‘oh! There’s hundreds of cats!’ I assume they have something of a rodent problem, though we never did find out. We discover a great little typical Italian café for a late lunch while we watch the Grand Prix. Proper bursting-with-filling baguettes and a huge salad between us: just as well we’ve got 2 hours and more to let them go down before we venture out again! We keep parallel to the ring road on the way back, to further explore the city, though this isn’t the most direct route back to the hotel. So we decide to sit and relax for a while before heading out to the north of the city to find some dinner. Nothing really excites our interest and we find ourselves back again at Café Dante, greeted like old friends and treated like honoured guests. We had planned to eat breakfast at the station this morning, as we have an early train to Rome (even at 300km/hr, it’s still going to take 3 hours), but when we had arrived home last night, a breakfast box was already waiting for us! We strip its contents of our favourites and stash them in hand luggage, for consumption over tea and coffee in the station café. The train ride is great; lots of countryside, but also lots of tunnels – and at massive speeds! I had expected the temperature to get warmer as we travelled south, but strangely it has become slightly cooler. After another long walk through Rome though, I am beginning to feel the effects, so we call it a day slightly earlier in the afternoon than usual, and grab a cab back to our hotel. Oh, and I’ve picked up another mosquito bite! I thoroughly refrigerate under the air conditioning and am eventually equal to the task of spending another evening drinking Italian beer and eating Italian sausage and chips, in bar Marconi. Which has multi-lingual welcome signs over each booth, and is run by Italian speaking Japanese guys, who are great fun. We find a charming little café on the edge of the ancient old town and settle down to a sumptuous sharing platter of local meat and cheeses with fresh bread and butter. Nom Nom! Afterwards we take a stroll around the old part of the village. Though it’s quite small, it’s a little surreal as away from the main drag there’s not a sound on the narrow cobbled streets and no-one is around. We head back into town and make a meandering walk back to the hotel, via buying a belt for Stevie and a new dress for me JWe eventually find ourselves back at the hotel by way of the Via Quattro Fontaine and execute a quick change before heading out again. It’s another warm night so we opt for a beer round the corner from Bar Marconi, on the main road where we can watch the world go by. As we sit, we watch the sky grow gradually darker as the clouds move swiftly around us from left to right and over the church opposite us. Then… the quickest of bright flashes. Followed by another. ‘Was that lightning?’ I ask, not sure whether I saw it. Oh yes it was… of a sudden it lights up the whole sky for a second or two. And then we hear the rumbling! Our fellow diners unhurriedly pick up their drinks and move inside. The waiter comes out to batten down the hatches and says ‘I give eet fivea minutes’. And sure enough, five minutes later we’re grabbing our things not quite so elegantly and dashing for the door. It’s a total downpour! We would happily have stayed, but the café only shares toilet facilities with the other café a few doors away, so we wait until the worst of the torrent subsides and make our way… back to Bar Marconi. 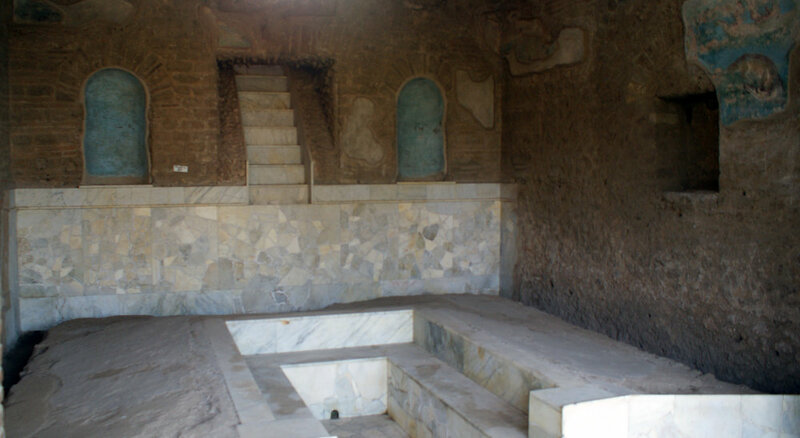 This morning, I have arranged tickets for the Sistene Chapel with one of the web-based tour operators. As we arrive outside the gates, the queue for the regular turn-up-and-wait tickets is already snaking its way around the block. We breathe a sigh of relief, find our tour guides, pick up our tickets and make our way to the museums. We came to Rome about 9 years ago and saw St Peter’s Basilica on that visit, which was magnificent. We were unable to see the chapel that time so have had to wait until now to return. We opt for the ‘short’ route to the Sistene Chapel; which may well be short, given that the museum is still fairly full of tourists (though not quite as bad as I had feared) but it still seems to take a long time to reach it. We do take one small detour to peak at the Pope’s back garden, and linger for some time in the map room, which is fascinating. We notice that, on the two maps of Italy, Vesuvius is still shown smouldering slightly. The Sistene Chapel, when we do get there, is absolutely worth the wait. I could have stayed for much longer, gazing at the paintings. Such vibrant colours, such amazing detail! And much larger than I had thought. Unfortunately, though understandably, no photography allowed so I have no pictures to show of the chapel, but I do most definitely recommend a visit. And I was pleased to see that for a change, people were adhering to the no photos rule. We finally allow ourselves to be herded out of the chapel towards the exit, given the number of people trying to stream their way in (though numbers are well controlled; we didn’t feel rushed, or too squashed), and make our way a street or two down from the museums to a little corner café. I enjoy a delicious caprese salad and we’re treated to free grapes with the bill! We take a slow stroll revisiting all the usual sights, down to the Castell and across the Pont Sant Angelo, down to the Piazza Navarro. Another pit-stop for beer and the obligatory free crisps and nuts, where I’m able to take time for some photographs of the architecture, and we can generally people-watch. Next stop is the Pantheon… oh hello that’s a lovely pair of sandals! So a quick retail stop, and then the Pantheon… which I loved the first time we visited but is considerably busier today (though no less impressive), and then on to the Trevi fountain. Again, we are not able to get as close to the fountain today as we did before, but we do take a couple of pictures before moving on. Stevie notices a fine tree sculpture nestling just inside the Church of Ignatius Loyola, so we duck inside for a closer look. I’m so glad we did! (I explain the one concrete fact I remember about him from my RE O-Level: ‘give me a child until 7 years old and I will give you the man’.) The church is stunning inside and like so many Italian buildings, is much larger than it appears from the street. The first thing you see is an imposing statue of the man himself, near the main altar at the back, but which rises in front of you to greet you as you walk in and can’t fail to impress, backlit by the beautiful stained glass window behind it. In one side chapel, there’s a delightful representation of all the most famous religious buildings from around the world. We spot, amongst others, Westminster Abbey, Sacre Coeur, Sagrada Familia, Chartres. And there are more of these delicate, lifelike tree sculptures dotted around the nave. Each has a plaque giving the species and the special properties that are attributed to the fruit. We pick up a leaflet on them as we leave. 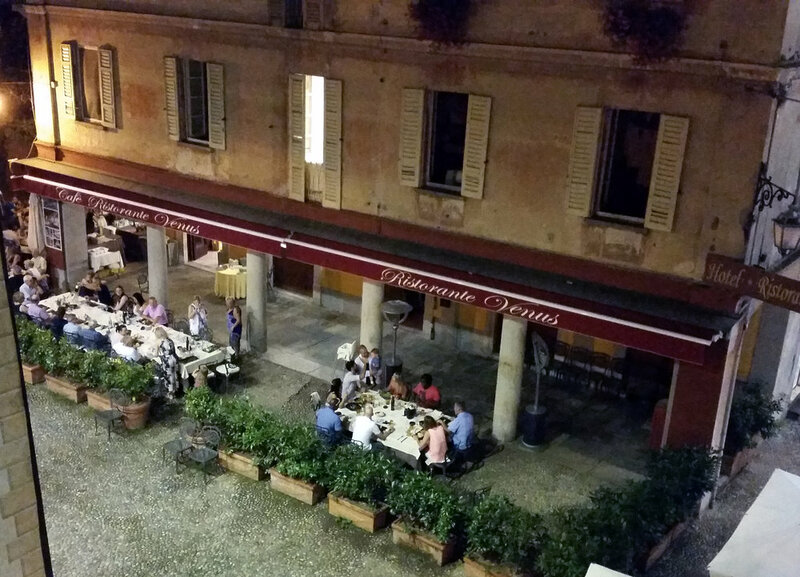 Eventually, we make our way to Piazza Madonna del Monte, where we stop for dinner. This is another place we visited on our last visit, again the last night in Rome, and was a very interesting night. It’s a real hidden gem not far from Termini station, lots of little cafes and a really local feel, with a warm atmosphere. The restaurant treat us really well and ply us with plenty of free limoncella! A Japanese couple even ask Stevie for a table while he’s queuing to pay the bill ‘be my guest, I’m only waiting to pay!’… much hilarity ensues, from the waiting staff also. 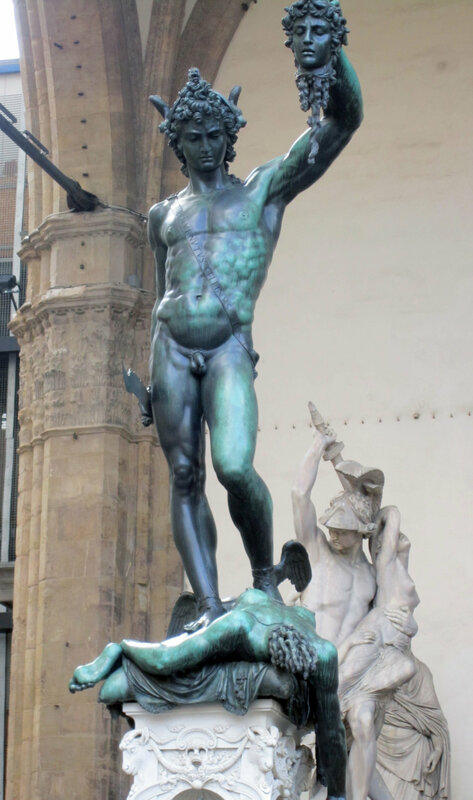 Today, we travel back on ourselves, to Florence; the reason for this will become apparent! We are glad to be up early as we realise once we check the itinerary that our train leaves not from Termini, but from Tibertina, which is very much in the other direction and on a different tube line. As it happens, we still arrive in plenty of time to catch the train. And we could easily get used to travelling business class! Our hotel is really impressive, very close to the centre and again tucked in a large apartment block, but surprisingly Tardis-like. Our room is spacious and attractive and even though we have a separate bathroom, it is for our exclusive use and is absolutely stunning. Our hosts are absolutely lovely ladies: friendly, welcoming and helpful. Having dropped our bags and explored our room and the breakfast room, we tear ourselves away to go out and explore Florence. 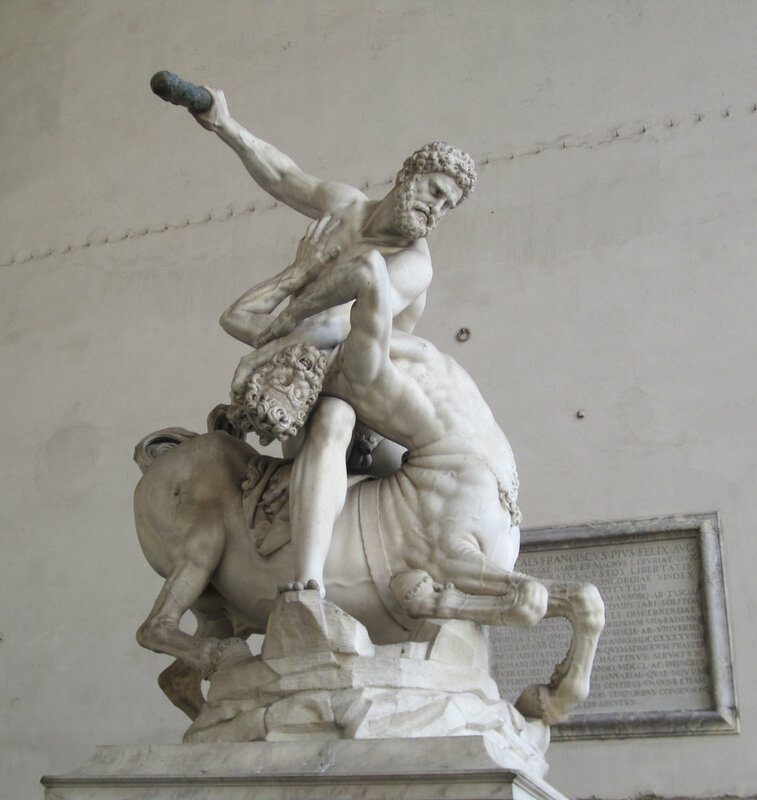 We make our way down to the Palazzo Vecchio and spend some time photographing the palace and all the statues, including a massive golden tortoise! Then we turn our attention to the breath-taking Duomo, which dominates the skyline – it must have been recently cleaned as the green, orange and white marble is absolutely gleaming in the afternoon sun (and we can see a cleaners’ cradle nearer one of the rear facades). Eventually, we wend our way through the narrow streets to find The Goose, opened less than a year ago by Glasgow-born Callum, who greets us from day one like long-lost friends. We enjoy a chat, good ale and tasty food before taking his recommendation for the Virgin Rock Bar, a few streets down. He makes it sound more dive-ish than it really is and we spend a couple of happy hours, watching a looping rock video programme, drinking ale and chatting and laughing with the bar staff. Today is the reason we had to divert back to Florence, as we’re deep in wine producing country and this happens to be the weekend of the annual Chianti festival! 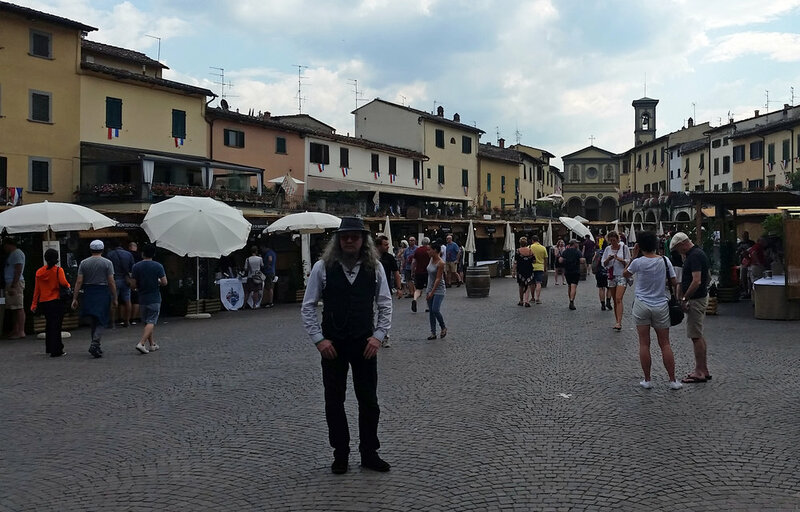 We board a bus to Greve-in-Chianti which visits all the tiny villages, picking up or putting down in each central piazza, while we alternately marvel at the view and keep track of our progress on Google maps – as we have no idea where to get off! Greve-in-Chianti is a very pretty little town in its own right and well worth a day trip even without the wine festival. We make our way from the piazza beside the main road, down to the main pedestrianised piazza, where the festival is taking place in 61 numbered booths. The piazza seems really big for a small town, and is surrounded by very inviting restaurants and bars. Once we’ve tasted 14 of the wines being exhibited (the festival ticket includes not only the glass but 7 tasting tickets), we pick our favourite and buy a bottle. We also pick up homemade local tomato chutney from a charming young man of about 10 years old, who’s shyness dissipates somewhat when we tell him to ‘tieni il resto’ (keep the change) of about €2. A very pleasant hour is then spent in one of the piazza’s restaurants, before heading for the bus back to Florence – which we only just make! We pop back to the Goose for dinner and then on again to the Rock Bar. I pop into the ladies and feel something heavy under my 50s-style skirt – my bracelet! The magnetised clasp had managed to attach itself to one of the ties and has remained there through a very thorough room search and two pub visits! Relieved is not the word (but now we’ll have to find another excuse to visit Brighton again). Tonight in the Rock Bar, there is a live band on, with various playing and singing friends of the band taking turns with them on stage. Stevie has a quiet word with the singer and before I can say ‘professional ligger’ is up there playing ‘Sweet Home Alabama’! This has to go out live… We stay on to hear the rest of the set, make some new friends, and finally manage to find our hotel again at quarter to three. As a result of last night’s later than intended shenanigans, we are unsurprisingly awake slightly later than intended, but manage to make it onto a train for Modena and the two Ferrari museums, before lunchtime. Our first stop is the Enzo Ferrari museum in Modena itself, only a ten-minute walk from the station, and marked by a green painted line on the pavement all the way – it could not have been easier to find! The museum itself is housed in Enzo’s original house, where he and his father worked on cars in the attached outbuildings and which now houses historic Ferraris. There is a regular and very comfortable coach shuttle between Modena and Marinello, where the factory museum is based, and this site concentrates more on the F1 history of the marque. Neither are very big but quite a lot of information is presented in both sites, in a sympathetic way. Stevie’s particular favourite was the room housing 7 world championship Ferraris, lined up next to each other. I looked across at him and his jaw had dropped (I reached up and gently eased it closed before he started to drool). Back in Florence, we decide to try the Brewdog bar as it’s only just around the corner (and we are shareholders dontcha know) but it’s not at all like the Brewdogs at home; not at all inviting, very poor atmosphere and apathetic bar staff. So we pop back to say our goodbyes to Callum at The Goose one last time and have an early night. Maybe as a result of spending time in a more rural setting, I have added ten more bites to my collection. Today, we travel onwards once more, to Sorrento. Leaving this hotel for the last time is bitter-sweet, we’ve enjoyed staying there, and exploring Florence, so much. We will have to return! We connect via ferry from Naples to Sorrento, which is a bit of a mission. Everyone else in Italy has been lovely but people in Naples are the least helpful (a vague wave and ‘150 metres’ is the best we get in the way of directions; a grunt and a nod are a standard response). Finally, a fellow traveller lets us in on the secret of which quay our ferry departs from. Vesuvius looks broodingly down upon us as we motor across the bay; we’re going up there tomorrow! It’s gently smoking... or it might just be clouds? Sorrento is enchanting, more so the further we venture from the new town to the old, eventually manhandling our cases down flights of steps cut from the cliff. But it’s well worth it when we arrive at our hotel! Another massive apartment in a tall but long apartment building, on the top floor, but still ranged over three floors and a roof terrace! We are greeted enthusiastically by our lovely host, who shows us our room and invites us onto the terrace to enjoy some local wine while she gives us a summary of the local sights. Delightful! We take a wander round Sorrento, back up to the newer areas from the old winding streets. I buy a scarf in the (vain) hope that this might discourage the over-friendly local mosquitoes. The proprietress of one of the gelato shops points out where we can buy local cheese and so, after the purchase of cheese and crackers, we make our way back to say thank you by enjoying some of her homemade ice-cream. We take our cheese, crackers, and our bottle of Chianti up to the roof terrace and watch the boats in the harbour as we relax. From here, we can pick out where we’d like to go for dinner, after enjoying a pint (or two) on the very edge of the wharf. The restaurant is supplied direct with fresh fish from the fishing boat and the menu is dependent on what they’ve been able to catch that day. Clams and sea bream are delicious, watching the sun go down slowly over Vesuvius. Breakfast is served on the roof terrace, but unfortunately for me, word of my arrival is out among the local winged inhabitants, and we are plagued by wasps. Our other host, Sergio, has prepared lemon tart which looks absolutely scrumptious but unfortunately, this only increases the aerial bombardment and I am forced into a tactical retreat indoors. Sergio, bless his generous Mediterranean heart, doesn’t even seem to notice the snub and when he hears we need to reach Positano, promptly phones for a taxi and negotiates a special rate for us. We are picked up promptly by the efficient and chatty Isabella who drops us as close as possible to the centre of Positano on the main road (it clings to the cliff) with an admonition to call her an hour before we leave and to meet her at the same place for a return trip. We make our boat with more than enough time to spare. 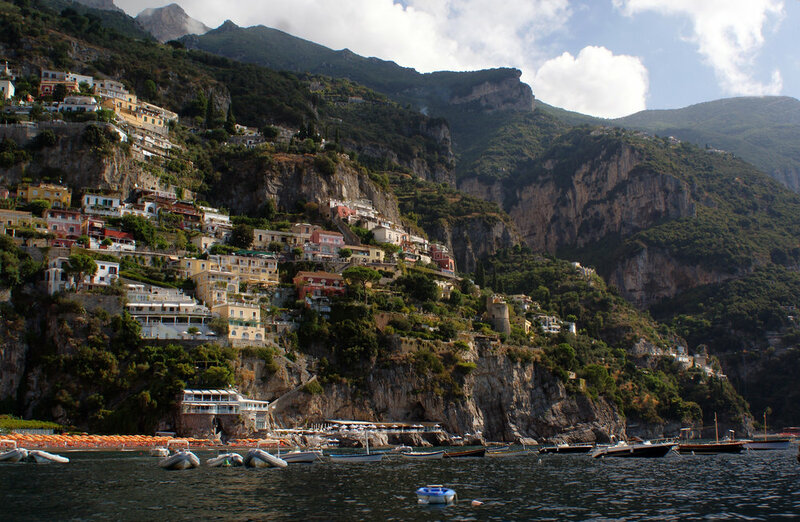 I’ve been so excited about taking this trip down the Amalfi coast, since I booked it on a wet English afternoon in February. Our fellow trippers are an Australian couple on a European tour and an Irish couple, who may well be on honeymoon (he is quick to point out their new status). Also a group of three typically boisterous Americans, who have Sicilian ancestry. Our captain and host is Pepe (short for Giuseppe) who used to be a big cheese in finance but gave it all up to earn money doing what he loves – piloting his boat up and down the coast. We learn he has four daughters to support, who range in age from 19 years to 4 days. The Irish newlyweds are quick to feel the effects of the choppy wakes that rock our little craft whenever a large yacht passes, and spend much of the trip below decks. Which seems a shame, as this wasn’t a cheap day out. 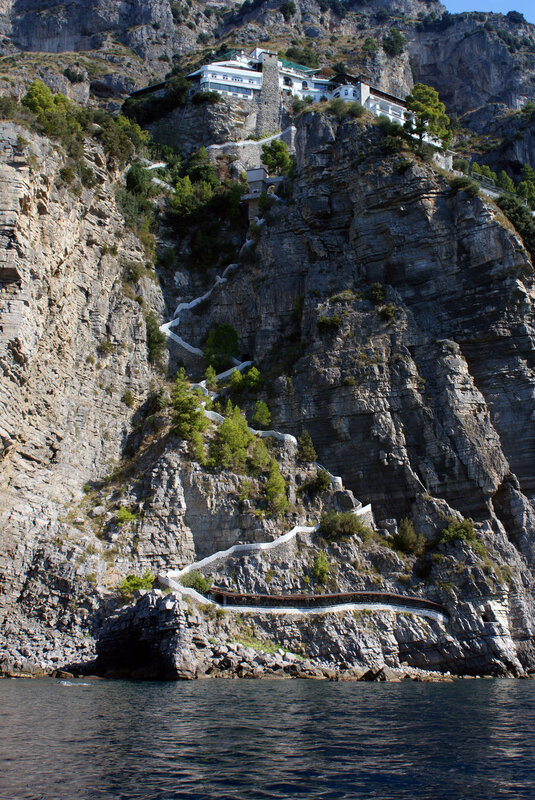 On arrival in Amalfi, we take bets as to whether they will opt to join us for the return trip, or hop on one of the plentiful buses. Bless their tender hearts and empty stomachs, there they are and putting a surprisingly smiley face on it, fair play to them. Rather than spend our free time in Amalfi and the surrounding countryside, we opt to visit a local restaurant just down the coast which is not accessible by road, and enjoy a lunch of more freshly caught seafood, and a large carafe of wine. All while enjoying the view of the bay; this sure isn’t the River Chelmer! We call Isabella from a café in Positano, watching a sudden thunderstorm lash down outside and varioiusly, people running for cover, or soaked through, trudging along and resigned to their fate. Isabella unfortunately is on another job it turns out, and we’re met by a very expressive and fluent (in English) driver in a silver Mercedes. So we return to Sorrento in some style! Today we return to Naples and it’s going to be such a wrench! We already knew when we arrived, that we would have preferred to spend more time in Sorrento… but it was too late to change our plans. When we emerge from our room, we find the table directly outside bursting with goodies. The lovely Sergio had noticed that we were bombarded by wasps yesterday and that my legs are swollen with bites, and despite the continuing gorgeous weather, has moved us inside for breakfast. It transpires that one of the nearby buildings has been empty for some time and therefore, wasps have taken up squatters’ rights. They are then attracted by the sumptuous breakfasts being laid out every morning. Which I assume partly explains why we weren’t mobbed on the afternoon that we enjoyed our cheese and wine – it was a mixture of time of day and heat of the afternoon. 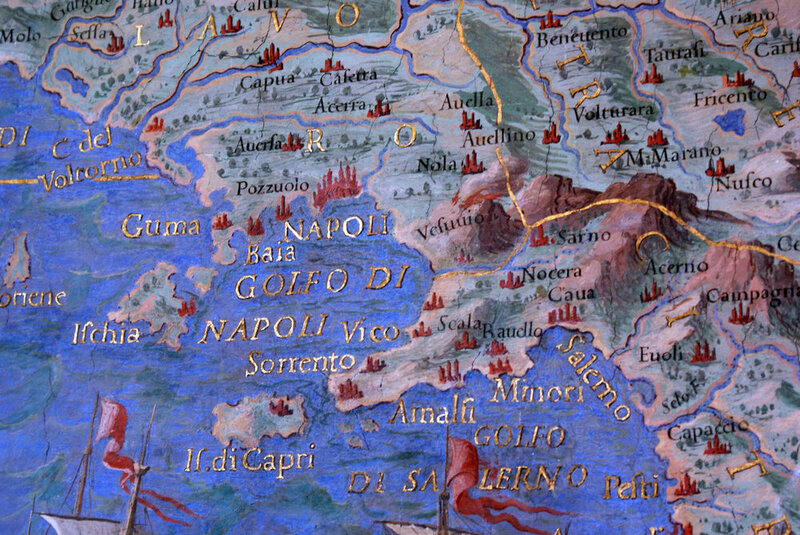 We return to Naples, in all it’s chaotic, medieval madness. We notice that there aren’t any cars on the roads without any dings or scratches! And our cab driver is as mad as all the others, keeping up a stream of anecdotes in English, imprecations in Italian, hand gestures and changing of lanes. But it all seems fairly cartoon-ish – there is no malice behind any of it, it’s all more for show. When we venture out to explore the vicinity, it’s easy to see why UNESCO described Naples as ‘the biggest open-air museum in the world’. However, it’s a slightly run-down one who’s curators have turned a blind eye to vandalism of the exhibits: graffiti is everywhere; the only buildings to have escaped are those that are obviously churches (buildings with large doors nestled between shopfronts are not immune, though their purpose is ambiguous to this non-native). After acquiring one more pair of shoes, a bag of local twisty pasta, and imbibing a cheap beer or two, we take a recommendation from our receptionist and have dinner at a nicer pizza restaurant in one of the main squares; Stevie isn’t as impressed with his calzone as I am with mine, though the portions are huge and I’m tempted to concentrate on the scrummiest caprese I’ve tasted yet (we agree later that, on the whole, the pizzas we had in Rome were actually nicer than the ones we eat in Naples). We pop into a bar 100 yards from our hotel for a nightcap; Napoli are playing in Serie A tonight and the bar – The Greenwich! – is fairly full. After an early goal by the opposing side, they win 2-1, so it’s something of a rollercoaster ride but the local fans are good fun. Stevie is especially intrigued by the cooler in the middle of the main bar area, which means you can help yourself to a bottle, and get charged for it when you bring it to the bar to be opened. This morning, arriving at the Pompeii archaeological site, we decide to take the bus to Vesuvius first and see Pompeii while it’s quieter and the temperature has dropped (logically, it’s going to be cooler up the side of a mountain? ), which proves to be the sensible option. We arrive inside the gates of the Vesuvius national park and transfer to converted army trucks. The very comfortable-looking interior belies the fact that these are, from the outside, very obviously all-terrain vehicles. I notice, but refrain from pointing out, that the membrane between the driver’s cab area and the passenger area (and this isn’t a separating ‘curtain’ as between classes on cut-price airlines; this is in lieu of actual truck body on that section of the vehicle, so bad is the terrain that the body jolts in different directions to the cab) is all but ripped apart from the contrary jolting action over time. It’s really not possible to explain how bumpy is this ride – though it undoubtedly adds to the atmosphere! After another 30 minutes, we arrive in a large turning/parking area and are invited to hike the remaining half a mile to the summit. Ooh a breeze you might say… but note this is too steep for an army all-terrain vehicle to manoeuvre. In truth, it takes about 20 minutes and is a narrow path but I’ve been on Scottish munroes more strenuous than this (my idea of fun is most definitely not sweating my way up a mountain). The view – even from halfway up the path – is pretty awesome (and I mean that in the traditional sense of the word), as the ‘red zone’ stretches out in front of you and across a bay so blue it’s only the odd cloud (also below you) that shows you where the sky finishes and the sea begins. Only Athens from the Acropolis looked more built-up than this and while it is breath-taking, you wouldn’t persuade me to live here for anything (at least we know that Goatfell on Arran isn’t going to vomit white-hot ash on our cornflakes one unsuspecting morning). The various probes set up to measure the activity of the volcano are a very obvious and reassuring sight. As obvious but much less reassuring is the odd puff of (smoke? Vapour?) that can be seen wafting from behind the barrier. I wanted to be able to look over the lip of the crater and see if it’s possible to look right down into the stomach of the volcano, but unless I walked around the other side, the lip is too high and the barrier too far from the edge. I am also mindful of the fact that we only have an hour in total to reach the top, look around, and get back down to meet the trucks. There are a few places on earth where I’ve been and felt very small, for different reasons; this is now one of them. The thought that nature could just quite literally erupt underneath us (though I grant we would hope that some kind of advance warning would have been picked up), and not just not care that we’re there, but to an extent not even be aware that we are – that anyone’s presence here is a complete irrelevance – is some concept to get your head around, so egotistical are we as a matter of course. The ride back is, of course, just as bumpy, but less imbued with momentousness. We have been to the top of hell and lived to endure a mere bumpy ride back to mortality. Next stop: Pompeii! The free but comprehensive guide book is a revelation (it would have added a good fiver the entrance price in the UK) and we enter a site that is as eerie as it is unexpected: much larger than we had originally understood, perhaps because more of the city is being excavated every day. We had two hours before the site closed for the day, but could have spent four hours and still only seen a corner of it. Highlights were the main square and the smaller squares leading off (it reminded me of a giant outdoor cathedral with smaller, side chapels), and the more famous large houses with their mosaics and shrines. Hard to imagine that the steeply rising slope that is the entrance to the site would have been the harbour at the time of the explosion – and the 3km of land now separating it from the current water’s edge landed there during the course of one night. Humbled, thoughtful and tired, we make our way back to the city for a cheap pizza, followed by the last of our bottle of Chianti (which we can’t take on the plane tomorrow! ), and listen to the Tottenham match (almost wish we hadn’t). Today, we return to Essex. We rise in plenty of time so that we can pack leisurely. All that’s then left is a final mad taxi dash (during which, we see our one and only Naples-based traffic accident. A taxi gently bumps a scooter; the rider shrugs, picks himself up, and carries on) and one last business class train ride. We have a quick stop in Rome for lunch, and then it’s on to Ciampino and a plane home. Next year, we will feel as though we’re on a permanent holiday, since we’re uprooting to Scotland, so no big trips are planned. And then we want to make a tour of Germany. But after that, a return to Sorrento and Florence (and hopefully at the same hotels) is definitely on the cards.